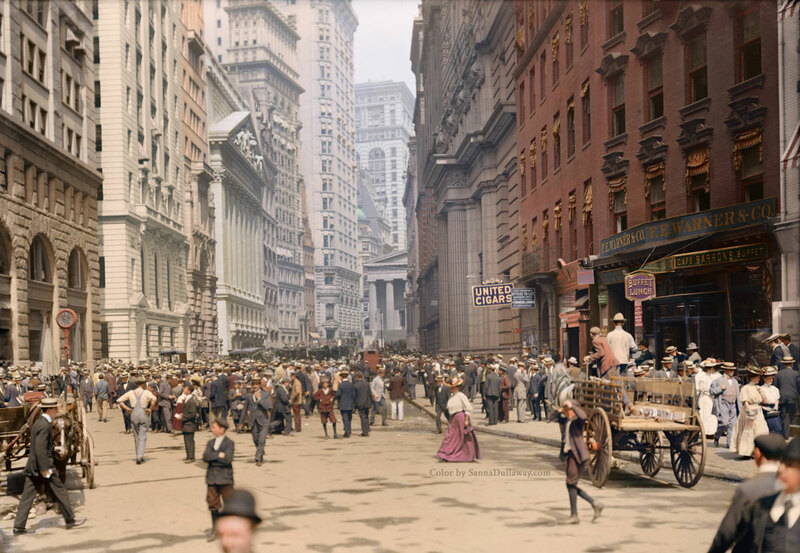 In this amazing colorized photo by Sanna Dullaway, we see Broad Street in New York City some time between 1900 and 1910. You can find the original photo at the Library of Congress here. You can also find the present-day streetview of this image below. The curb brokers had been kicked out of the Mills Building front by 1907, and had moved to the pavement outside the Blair Building where cabbies lined up. There they were given a “little domain of asphalt” fenced off by the police on Broad Street between Exchange Place and Beaver Street, after Police Commissioner McAddo took office. As of 1907, the curb market operated starting at 10’clock in the morning, each day except Sundays, until a gong at 3 o’clock. Orders for the purchase and sale of securities were shouted down from the windows of nearby brokerages, with the execution of the sale then shouted back up to the brokerage.